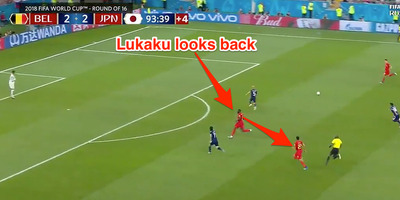 Romelu Lukaku’s dummy play to set up Belgium’s game-winning goal over Japan was one of the best plays of the 2018 World Cup. Lukaku explained to Business Insider how he knew he needed to create space for his teammates and how he made subtle eye contact with another Belgian player to set up the goal. Lukaku said that despite not touching the ball on the play, it was among the best plays of his career. 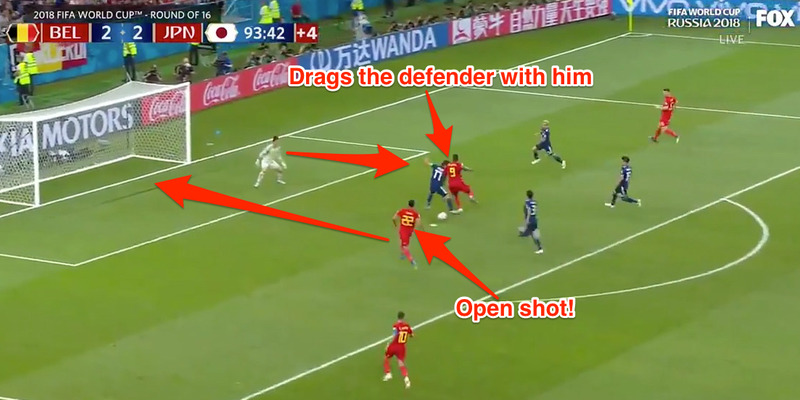 One of the more thrilling matches of the 2018 World Cup was Belgium’s 3-2 win over Japan in the knockout stage. Down 0-2, Belgium came roaring back, scoring two goals in the second half to draw level ahead of stoppage time. In the 94th minute, Belgian midfielder Kevin De Bruyne led one final counterattack, relentlessly pushing the ball up the field. 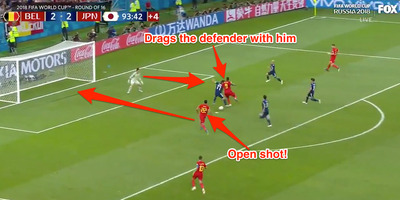 After Thomas Meunier got the ball on the right wing, Belgium had a three-on-two – that’s when star striker Romelu Lukaku made one of the most brilliant plays of the World Cup. As Meunier crossed the ball, Lukaku made a hard charge, drawing a defender with him. Rather than strike his shot, Lukaku let the ball pass right by him, setting up Nacer Chadli for an easy, game-winning shot. A perfectly executed dummy. We dare you to find a better counterattack! The unspoken chemistry between players shines on such plays. Lukaku said that when the counterattack began, he knew he could not do a typical run because it wouldn’t open up the necessary space to produce a good look. Furthermore, Lukaku said, just before the dummy he made eye contact with Chadli to let him know he would make the play. You can see the moment where Lukaku looked back. Lukaku has had plenty of goals and assists in his career – could a play where he didn’t touch the ball rank among his best? He was honest.